Beginning in the early 90's, roughly 12 years after the 1981 announcement of the Reagan EPA that climate change was real and a danger to all of global civilization, I began to wonder if the world would actually act. Early in the decade, we had the first of many UN sponsored meetings under the framework convention adopted at the Earth Summit in Rio in June of 1992. I had gone to New York that spring to participate in talks sponsored by the International Solar Energy Society. There was talk of carbon pricing and carbon cap and trade, but no one was talking as radical as the actual EPA report which called for a 400 % tax on carbon and abolishing the use of coal altogether if we were to actually stop this climate train wreck in its tracks. 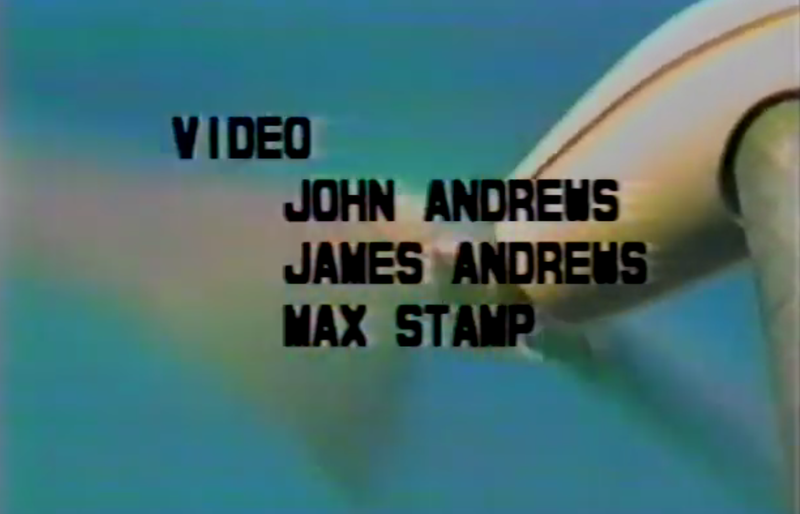 Obviously our regulators were more impressed with the end of the world as we know it back then. It was during that time that I began to write about climate change ultimately publishing "Lightland: Climate Change and the Human Potential" in 2001. It was also during that time that I began building my city of the future. I called it Argonon. It was a city designed to have it's own energy system, it's own food supply, an inner protective world, and a host of other sustainable features that would support its inhabitants through a very dark period of human development. It was an Earthship for 250,000 earthlings of all ages and race. 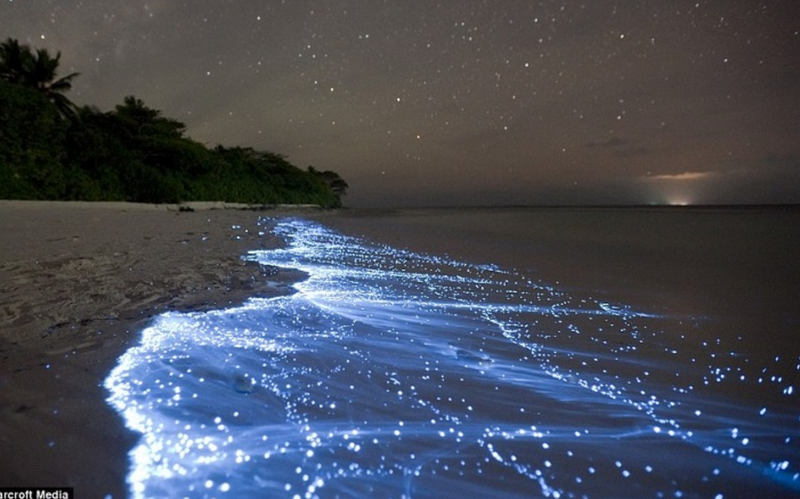 It would be full of the best engineers, scientists, farmers, artists, musicians, and dreamers. But the key technological invention of the city was what I called an EMASER. This Electro Magnetic Assisted Solar Energy Receiver was a laser device that would emanate energy into the atmosphere for the purpose of controlling incoming light. It literally would intercept solar energy thousands of feet into the atmosphere and like the common place mirage on our highways and flat deserts, reflect the light by a few degrees. These atmospheric mirages would be of dual purpose. One, they would reduce the amount of energy hitting one part of the earth's surface, while increasing the energy on another part. The strategy of Argonon was straightforward enough. Because it was designed for the latter half of the 21st century when Climate Change had rocketed through the 2 degrees C set by global treaty, it had an array of EMASERs around its perimeter that projected laser induced mirages into the sky thus controlling the ground and air temperatures in the city. And in addition, that bent light was shunted to the solar fields surrounding the city thus increasing the production of the panels through more solar flux. It was a creme rinse and a floor wax. But it was also a dessert topping. An array of lasers of this power would also have immense defensive potential. I rarely tell this story because it sounds like a NBA sized tall tale. To document it, I even shot a video of our tests, but somehow my director lost the footage. Nevertheless, with the help of several UT Professors in Engineering and Physics, we procured a small DARPA grant to test the concept of lasing the atmosphere to create a mirage that would bend incoming light. If you don't know what DARPA is, you should. We used a carbon dioxide laser and hoped to vibrate the carbon dioxide molecule in the experimental atmosphere to create the effect. After several days of testing, our results were inconclusive. But I was not too discouraged. By the time we had set up the experiment and the testing bed somewhere in the basement of the University of Texas Physics department, I had already determined that we would have to use an Argon laser. After all, CO2 in the atmosphere is only 410 parts per million, (headed to 500) while Argon is 30,000 parts per million. Now, 30 years after the Earth Summit, and 40 years after Dan Rather warned us on CBS evening news of impending calamity, we have a minority elected US government that disdains the perils of Climate Change while simultaneously demanding a wall to stop Central Americans who are fleeing it. And I find myself thinking and writing of EMASERS and EARTHSHIPS once again. And thanks to advancements in Laser science since these tests, lasing the atmosphere to control climate while powering solar fields might prove to be a solution for a world that because of 40 years of inaction, has traded mitigation for adaptation. About 40 years ago, I started working on developing a wind farm. It would be the first in Texas and the second in the United States. I had a lot of work to do. I had to find a windy place with a 3 phase power line that could take the power. And I had to get it connected. The Public Utility Policy Act had been passed and signed by President Carter in 1978 and with that law, Qualifying Facilities or "QF"s were allowed and even encouraged to plug into the grid and get paid for that energy by the utility at a fair rate called "avoided cost". It was a revolutionary thing. Since I had been on the PUC advisory committee that implemented PURPA, I was on pretty solid ground with these newly enacted rights that producers of energy using wind, solar and other qualifying sources now enjoyed. But the law was new and utilities were not that excited about it. Southwest Public Service was the utility in the Texas Pandhandle that I negotiated with. And although quite conservative, they did ultimately offer a contract that represented their version of "avoided cost" which was the basis for the payment under PURPA. I was 31 when the deal was somewhat complete. I had the lease agreement for the land (thanks to my cousin, Carl Kennedy, the county judge), the interconnect agreement with SPS for the production, the turbines had been ordered, and the financing was secured. 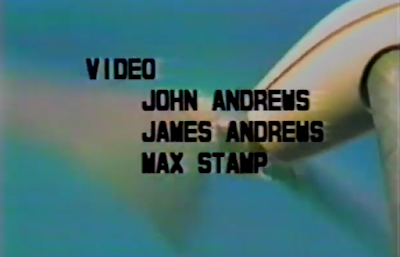 We began construction late in 1981 and we videotaped it. Installation only took a very full week. We also included interviews with Mr. Mack, the Coca Cola distributor who had two units in the same location, and Father Joe James, who put up 5 more units around his passively designed Catholic Church in Lubbock. I used this documentary in my plenary speech to the National Solar and Wind Conference in Houston that next spring. The audio quality degraded for the first minute or so. Since these early days, I have been involved in the ever growing Wind Industry, securing leases for both wind developers and utilities, sometimes erecting wind monitoring systems to prove the winds, often working the legislature for tax abatements while arguing at the PUC for favorable interconnect rules and transmission line improvements. During my time at Austin Energy, I helped oversee well over a Gigawatt of Wind Power in 14 years. (AE now has 1850 MWs). When I left AE and was appointed to the Electric Utility Commission, I approved over 600 MWs of Wind and another 600 MWs of solar. Since the early 90s, like the late 70s, we have had Presidents and Administrations that understood the wisdom and the importance of reaching as high a penetration of carbon-free energy as possible. Life was not always good, but it wasn't bad. It was rational. But then, a not so funny thing happened on the way to dealing with the climate issue. The Republican Party became the party of Intellectual poverty. They nominated a pro-coal candidate who skillfully ran off with the presidential election with 70,000 votes to spare while losing the popular vote by 3 million. And that victory has emboldened the very worst of the climate denying wing of what used to be a rational and responsible national party. Nowhere is that more obvious than right here in Austin. Our own heart of darkness lurks in its Congress Street headquarters spewing outright lies and misinformation fronting for their Kock-sucker benefactors. They are trying to beat back the tide with a cane. and an army of enemies. And they will be remembered for their crimes against their own. They will Reap the Wind. There is a somewhat well known psychological effect that describes a cognitive bias called the Dunning-Kruger effect. It's when people of low ability have illusory superiority and incorrectly assess their own ability to be higher than it really is. The term lends a scientific name and explanation to a problem that many people immediately recognize—that fools are blind to their own foolishness. As Charles Darwin wrote in his book The Descent of Man, "Ignorance more frequently begets confidence than does knowledge." Essentially, low ability people do not possess the skills needed to recognize their own incompetence. The combination of poor self-awareness and low cognitive ability leads them to overestimate their own capabilities. The effect is named after researchers David Dunning and Justin Kruger, the two social psychologists who first described it. In their original study on this psychological phenomenon, they performed a series of four investigations and found that people who scored in the lowest percentiles on tests of grammar, humor, and logic also tended to dramatically overestimate how well they had performed. Their actual test scores placed them in the 12th percentile, yet they estimated that their performance placed them in the 62nd percentile. This effect can have a profound impact on what people believe, the decisions they make, and the actions they take. In one study, Dunning found that women performed equally to men on a science quiz, and yet women underestimated their performance because they believed they had less scientific reasoning ability than men. Dunning and his colleagues have also performed experiments in which they ask respondents if they are familiar with a variety of terms related to subjects including politics, biology, physics, and geography. Along with genuine subject-relevant concepts, they interjected completely made up terms. In one such study, approximately 90 percent of respondents claimed that they had at least some knowledge of the made up terms. 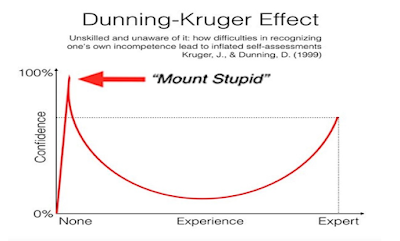 Consistent with other findings related to the Dunning-Kruger effect, the more familiar participants claimed that they were with a topic, the more likely they were to also claim they were familiar with the meaningless terms. As Dunning has suggested, the very trouble with ignorance is that it can feel just like expertise." So if the incompetent tend to think they are experts, what to genuine experts think of their own abilities? Dunning and Kruger found that those at the high end of the competence spectrum did hold more realistic views of their own knowledge and capabilities. However, these experts actually tended to underestimate their own abilities relative to how others did." 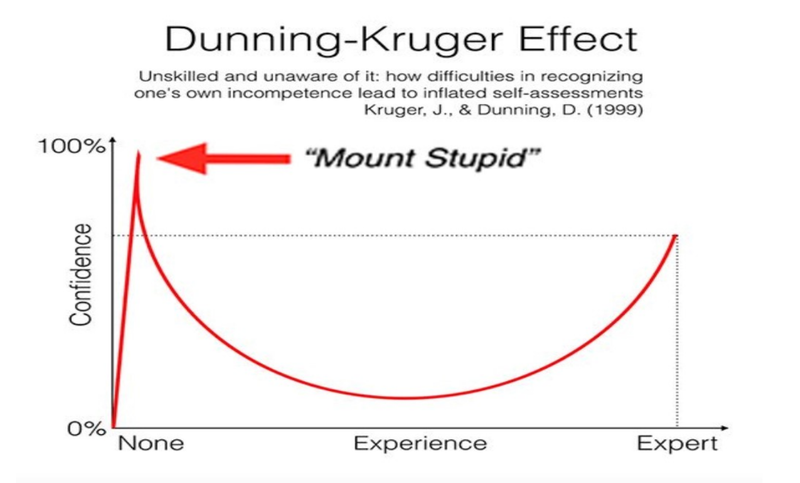 Of course there is a lot out there about Dunning Kruger these days mostly because we have elected a leader who seems to be a poster child for the effect. 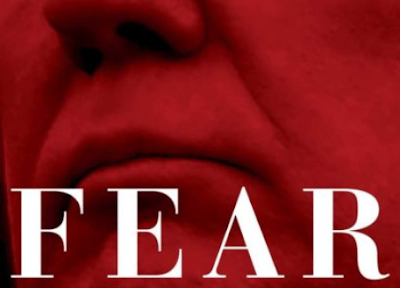 He uses the best words, he is very smart, he knows more about "intelligence" than his experts, knows more than his generals, he loves tariffs, thinks MOU's are useless pieces of paper, and on and on. But my point is not about him. It's about the folks who voted for him. As the weeks have turned into years, I now see the administration for what it seems to be. An bumbling incompetent bunch of pretenders who think they know more than they do. Because they were elected by the thinnest of margins by their fellow Dunning Krugerites, they characterize it as the greatest electoral college victory in American history even though Obama's victories were greater both times. They compensate for empty viewing stands by saying it was the greatest crowd ever. They back out of international trade treaties only to renegotiate a new better deal which looks very much like the original agreement. They secretly negotiate nuclear plant deals with the Saudi's as they back out of nuclear bomb deals with the Iranians. The Dunning-Kruger effect has real implications for Democracy. If weaponized, it allows for a dangerous manipulation of the voter pool. LOCK HER UP and BUILD THAT WALL become chants of solidarity that are really little more than thin veneers of respectability over the counter evolutionary demiurges of racism and misogyny. 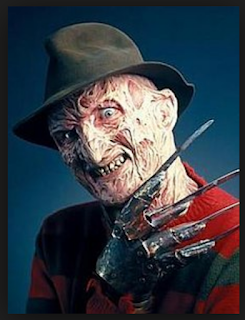 There is another Kruger out there with an E.
And Freddy was virtually all powerful in the dream world. So, let's end our nightmare by waking up. We can't sleep through this night. 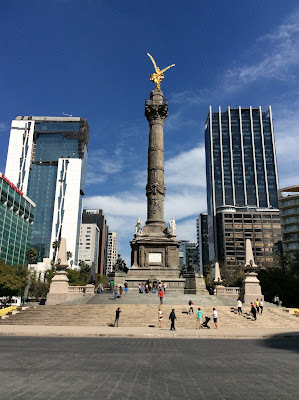 We generally take a family trip at the end of the year and this year we decided to spend time in Mexico City. Last year, we managed to choose New York City just in time for the arctic air blast that made Times Square colder than a meat locker. 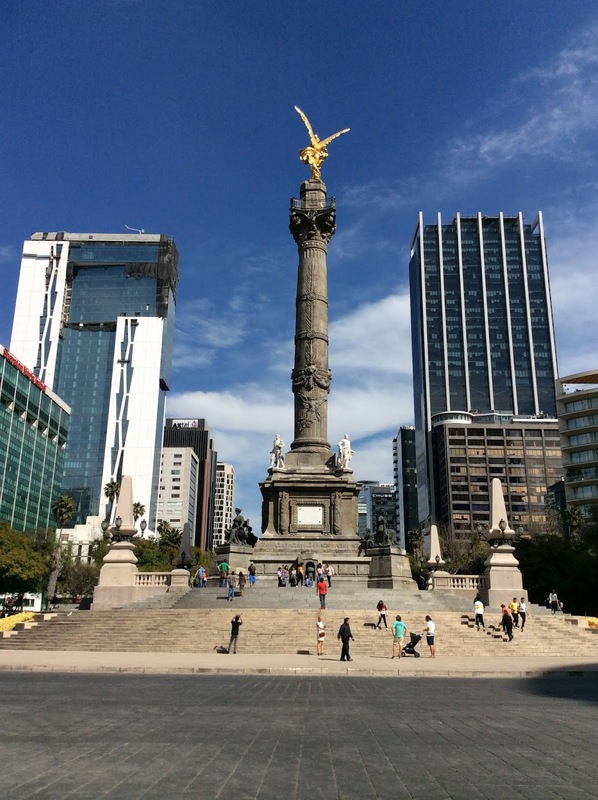 The weather in Mexico City or DF (DeEffy) as they call it, is pretty much perfect during the holidays. Every day was like LA; cool in the evenings and not hot during the day. (middle 70s) And during the holidays, Mexico City's pollution is greatly diminished which is important, because there's 20 something million people in the greater DF area. 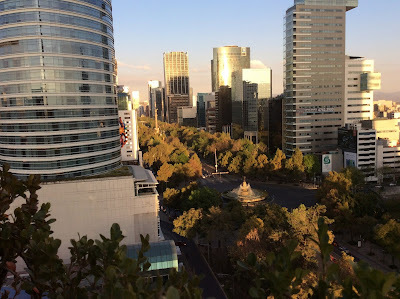 We stayed in a swanky Mexico Hotel on the Paseo de la Reforma, the main street of Mexico. 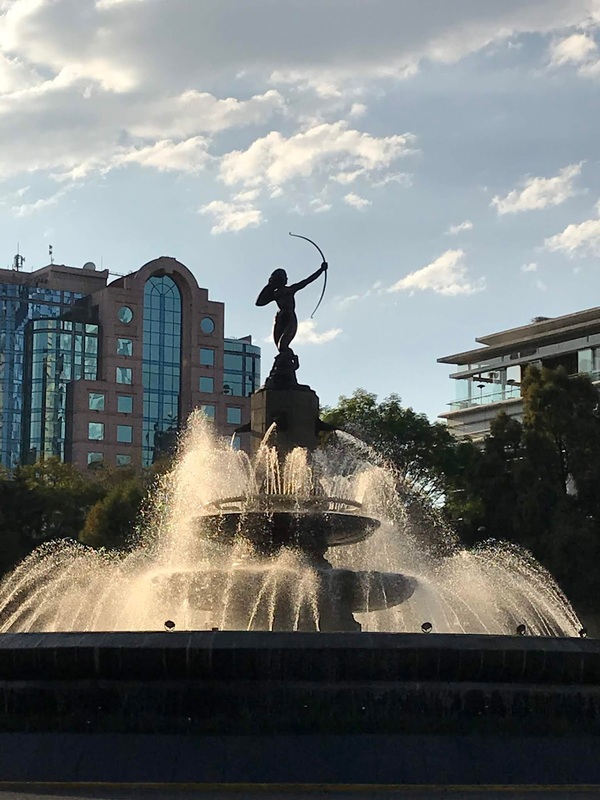 The Reforma is a grand European style street with 10 lanes of traffic, bicycle lanes, and shaded pedestrian walkways that goes from the center of the city from the huge (larger than Central Park) Chapultepec Park to the historic Zocolo out to the NE part of town. It's about 10 miles long. It is lined with 50 to 70 story towers on its west side close to the park where we stayed. From our room, we could see the Fountain of the Archer Goddess Diana and the huge Angel of the Independence monument a few blocks away. Like in Paris, the street is manicured and covered in flowers and groundcover. It's not the Champs-Elysees, but it's quite impressive. And it's more than a little odd to come back from this sophisticated foodie city to our American national conversation about building a wall to protect ourselves from a culture that has thousands of years of history. 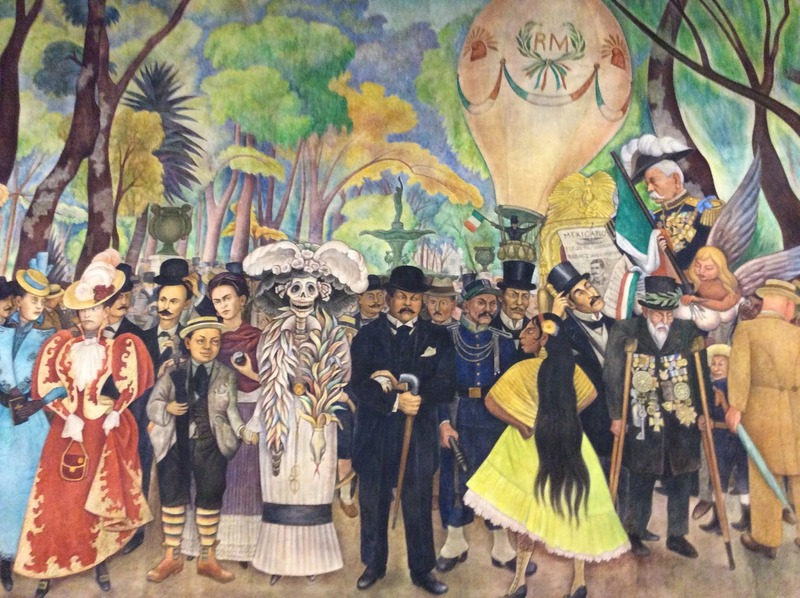 Mexico City dwellers must find that conversation deeply disturbing if not a bit culturally insane. 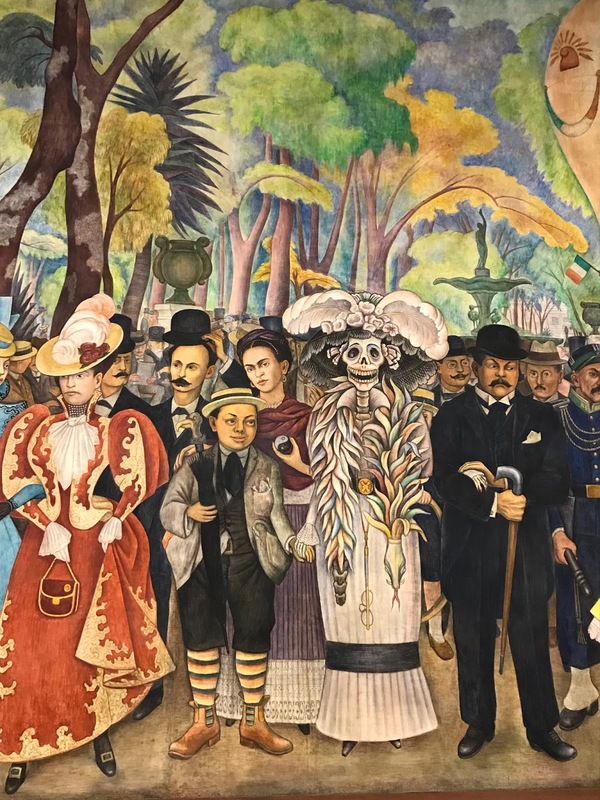 No visit to CDMX is complete without a day in the park. The anthropology museum is splendid and the 2 art museums are worth it. It is the most visited museum in Mexico. Located in the area between Paseo de la Reforma and Mahatma Gandhi Street within Chapultepec Park, it contains significant archaeological and anthropological artifacts from Mexico's pre-Columbian heritage, such as the Stone of the Sun (or the Aztec calendar stone) and the Aztec Xochipilli statue. One thing I got from this trip is that the calendar stone is not a calendar, it is a sacrificial altar where human hearts were cut out to appease the gods. I also got a sense of their history and how they moved from agriculture to a war society. It was this society that the Conquistadors first encountered. They were not helpless farmers, they were sophisticated overlords of a civilization with roots as old as the Egyptians. 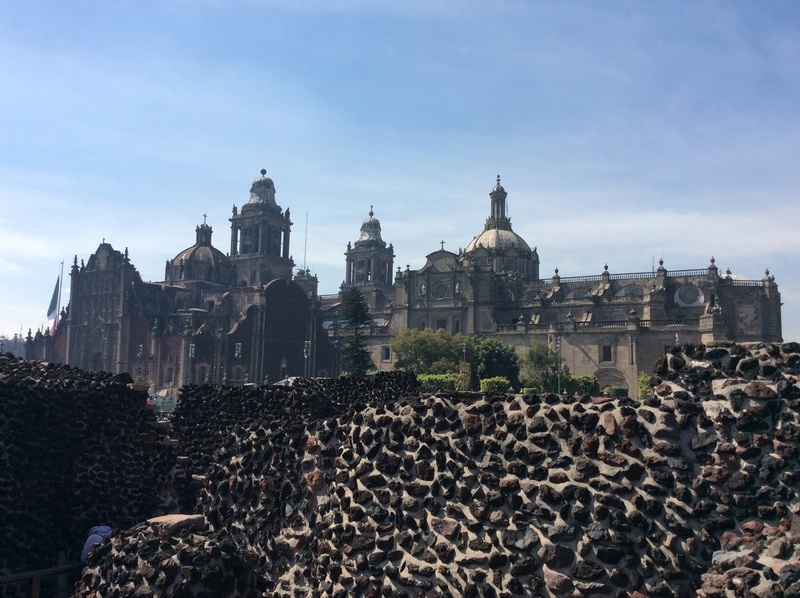 Like all conquerors, the Europeans built their temple right on top of the Templo Mayor, the pyramid temple in the very center of the original city that was built on an island in the original lake that existed in this valley. Watching the feathered dancers and shamans in the square around the European Cathedral, it's hard not to imagine that they consider this time of the Europeans to just be a 500 year old blip in their 3 thousand year history. Much like their dangerous neighbors to the north. Perhaps they should build that Wall.